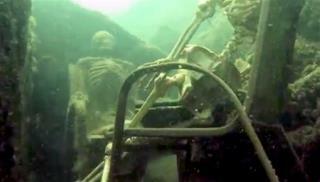 (Newser) – A Phoenix couple has claimed responsibility for putting two fake skeletons sitting in lawn chairs in the Colorado River in far west Arizona. Today's News-Herald reports the husband and wife approached the La Paz County Sheriff's Office earlier this week a little apprehensively and brought a photo as proof they were behind the prank in Parker. Lt. Curt Bagby says there are no plans to press charges and considers the incident harmless. He didn't identify the couple, but we now know the names of both skeletons: Bernie and Bernadette. "Lt. Curt Bagby says there are no plans to press charges and considers the incident harmless" Because polluting the water with plastic is harmless. Shoulda called them Bony and Bonadette Bonaparte.